Munster came home on the night of the game. There was no pub crawl in Exeter. After a savage battle with the locals, Munster were barely able to walk up the steps of the plane. Gloucester are up next in Thomond. There is a shared history of miracle matches and impossible comebacks. It is nearly 16 years now since that famous game when Munster had to win by 27 points or more and score four tries to qualify for the quarter-final. But it would be a grave dereliction of duty if we did not first pay tribute to the current heroes who braved the storms of Sandy Park and came home with a draw. What is it about Munster when Europe time comes around? Red Rum, the greatest Grand National horse ever, changed personality when he came to Aintree. The languid gallops on Southport beach gave no sign of the form that was to come. Old Red Rum caught fire when he arrived in the place he loved best, for the race he loved best. CJ Stander and Peter O'Mahony hardly raised a gallop this season but the back-rowers came alive in Sandy Park. There's an equine expression we use around these parts in praise of power, strength and manly resilience. The phrase may not be anatomically correct but truly it can be said these Munster Minotaurs are horses of men. The names may have changed but the numbers on the jerseys remain the same. The culture of redressing hurt by fighting to the last is a permanent given. You would have to be so proud of Munster. Exeter are Champions of England and lead the Premiership. Munster were written off by all but a few. The Chiefs were confident and maybe even a little bit cocky. Coach Rob Baxter said beforehand: "The truth is, we don't actually have to do much more than what we have been doing." Ah but Rob, my innocent man, Munster are at their best in Europe with only the occasional Mexit. The Munster supporters braved stormy skies and failed direct debits for such inconsequentials as monthly mortgages and overdue electricity bills. The Munster fans were put to huge extra expense when flights were cancelled and hotel deposits were lost. But the supporters showed up anyway on a weekend when wrought iron leaves were blown off Victorian railings by Storm Callum. If the Spanish Armada admirals had been from Munster, they would be eating tapas for their daily dinner in Exeter. Once the Munster men and women pass the 30mph limit, there's no turning back. But for all the bravery on the field and the love off of it, there is a sense this was a game Munster should have won. There were crucial turnovers when the line was no more than a few pick and drives away. Leinster would have won here. Leinster came away with four points from Sandy Park last year, but while all around are rightly praising the Blues for the swatting of Wasps, Munster are the last team they will want to meet if both progress to the knock-out stages. It is worth noting that when Munster were beaten by Racing in the Champions Cup semi-final last May, the defeat was our 50th loss in the competition. Forty-eight of those losses were away from home. Yes we will take the draw any day in Sandy Park. 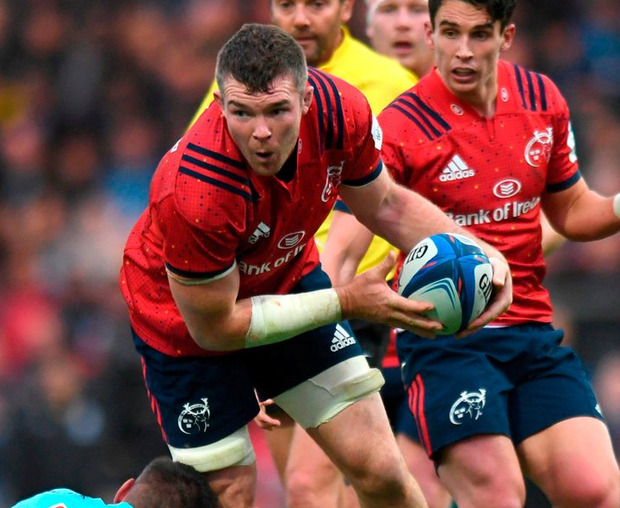 Munster will be hoping scrum-halves Alby Mathewson, a former All Black, and Conor Murray, who is the best in the world in his position, will return for the Gloucester game. Neil Cronin is only just back from injury and is not ready for a full game but he did very well in the last ten minutes when he came on for Duncan Williams, who was worn out from hard work. We will forgive Duncan's passing, which at times looked like he was trying to lob coins in to the wicker basket at the toll bridge. Exeter broke out from the second-half Munster siege and looked like scoring. The Chiefs fans were already whooping it up. The fort was breached and the braves were pouring through the gap. Duncan tracked back and made not one, but two try-saving tackles. This was a huge moment in the game. There is some hope Murray might appear on the bench. There are so many untrue rumours. My favourite is the one where JP is supposed to have offered Conor a million more than the IRFU if he switches over to the hurlers for the two in a row. Who makes them up? That's what I want to know. Disney, Pixar and Spielberg are looking for ye. The Irish teams seem to be stronger than the English on the evidence of the weekend. Gloucester barely got home against French champions Castres, who have a worse away record in Europe than Boris Johnson. Cherry and White out-half Danny Cipriani still has the ability to change games. Munster's maul might find them out. Gloucester like to play an open game and we will need to keep it tight early on. The English ended up with a very young front-row, and Munster have two excellent sets of front-rows. Munster it is then, but not by much.